Consisting of country case studies and comparative analyses from Latin American and US based political economists, this volume addresses the shortcomings of foreign investment for development, and sets out the challenges facing policy makers in this field. Thank you. You have successfully submitted this title. After almost twenty-five years of experimenting with the neo-liberal economic reforms collectively known as ‘Washington Consensus’ policies, Latin Americans are starting to re-assess the merits of these policies – at the voting booth. Many newly elected governments are beginning to scrutinize the role of foreign direct investment (FDI) in particular, and some nations have gone so far as to nationalize foreign firms. Without endorsing or condoning the actions taken by these governments, this volume demonstrates that it is quite rational for governments in the region to re-evaluate the role of FDI for their development paths. The great promise of FDI by multinational corporations is that capital will flow into your country and be a source of dynamic growth. Beyond boosting income and employment, the hope was that manufacturing FDI would bring knowledge spillovers that would build the skill and technological capacities of local firms, catalyzing broad-based economic growth; and environmental spillovers that would mitigate the domestic ecological impacts of industrial transformation. 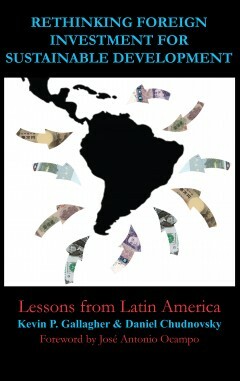 Consisting of country case studies and comparative analyses from Latin American and U.S.-based political economists, this volume finds that when FDI did materialize if often fell far short of generating the necessary linkages required to make FDI work for sustainable economic development. No reviews for this title. Kevin P. Gallagher is Assistant Professor of International Relations at Boston University and research associate at the Global Development and Environment Institute, Tufts University. Daniel Chudnovsky (1944-2007) was Director of the Centro de Investigaciones para la Transformación (CENIT) and Professor at the Universidad de San Andrés. José Antonio Ocampo is Professor of Professional Practice in International and Public Affairs and Director of the Program in Economic and Political Development at the School of International and Public Affairs, Columbia University. No series for this title.